The Washington State lease agreements are written for the use of landlord-tenant relationships in accordance with State Laws (RCW Title 59). The basis of all the contracts consist of a landlord seeking a party to occupy their space in return for monthly rent. There are also other terms and conditions such as who will pay for what utilities and expenses as well as guidelines for common areas (if any), smoking, pets, etc. Rental Application – To be used by the landlord in order to review the applying tenant’s employment, background, and financial details. Commercial Lease Agreement – Agreement in relation to the renting of property for a business related use such as office, retail, or industrial property. Lease with Option to Purchase Agreement – A generic residential contract with added terms and conditions for the purchasing of real estate and personal property. Month to Month Lease Agreement (Within Seattle – Outside Seattle) – Also referred to as a ‘tenancy at will’ for a landlord-tenant relationship that can be canceled at anytime with at least twenty (20) days’ notice (RCW 59.18.200). Room Rental (Roommate) Agreement – For the persons living in a shared arrangement to acknowledge common rules in the property. Standard Residential Lease Agreement (Within Seattle – Outside Seattle) – The most popular rental contract. It has a typical fixed start and end date with payment due dates and language for vacating at the end of the term. Sublease Agreement – For the act of a tenant re-renting their space under agreement with the landlord. Otherwise known as ‘subletting’. 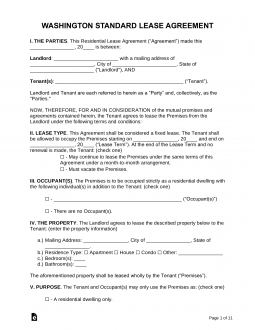 Termination Lease Letter – Form used to send to either a landlord or tenant their intent to cancel a month to month arrangement with the proper notice, twenty (20) days, as provided in RCW 59.18.200. *Fire Protection & Evacuation (§ 59.18.060) – Upon lease commencement the landlord must give the tenant a copy of a fire protection/safety information including an evacuation plan. This should include if the property has a smoking policy, emergency notification plan, and the route(s) to exit the building in the case of a fire. Landlord/Agent Identification (§ 59.18.060) – Landlord must give the tenant the person who is authorized to enter the property including the legal address for notices. If the information is not located in the lease agreement it must be listed conspicuously on the premises. NOTE: If the landlord does not reside in the State of Washington they must elect an agent that resides in the county for all notices. Lead Based Paint – Federal law requiring all landlords of properties built prior to 1978 to disclose to their tenants as within the walls probably exists lead paint that is hazardous and was used during that timespan. Mold (§ 59.18.060) – At the time of signing the landlord must give the tenant information about the dangers of mold as provided by the Department of Health. Move-in Checklist (§ 59.18.285) – Landlord is required to provide a move-in checklist to the tenant if there is a security deposit that is collected. If no checklist is provided the tenant is entitled to their entire deposit no matter the circumstances. Security Deposit Receipt (§ 59.18.270) – Landlord must provide the name and address of the banking institution where the funds are to be held on behalf of the tenant. In addition the landlord must provide the terms and conditions for how funds are to be held and dispersed. Nonrefundable Fees (§ 59.18.260) – If there are to be any non-refundable fees assessed by the landlord it must clearly state that the fee is not refundable. According to § 59.18.150 the landlord must provide at least two (2) days’ notice to enter the property for any maintenance or repair and one (1) day if they are seeking to show the property to another potential lessee or prospective buyer. Maximum – No State cap. Landlord may request as much as desired. Returning (§ 59.18.280) – Landlord must give back all funds related to the deposit within twenty one (21) days of tenant move out.